A few weeks ago, we published a detailed and informative post on what Lead Magnets are and how to use them to attract, locate and hold on to prospective buyers so that when they’re ready, they become customers or even evangelists for your product or service. If you haven’t read that, even if you think you’ve already got Lead Magnets down, check it out first at the link above. I’ll wait. If you’ve been here a while, you might have expected this. 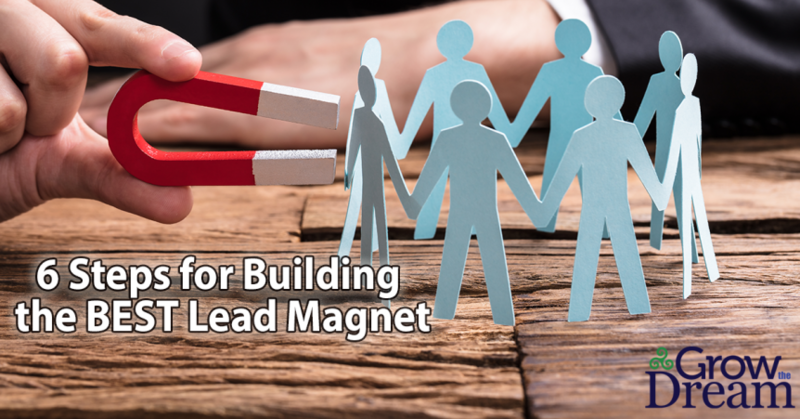 A lot of resources for Lead Magnets are going to jump right into the 6 or 4 or 25 essentials for building a Lead Magnet without ever asking is it what your ideal clients want and need. Either they assume you already know your clients or they don’t care that you might waste your time creating broad offers, never understanding why you’re not converting leads into sales. Here at Grow The Dream, we believe that your time and energy are valuable. It’s hard enough to start and maintain a successful business without just throwing stuff at a wall and hoping some sticks. If you take the time to do the hard work at the beginning of fully fleshing out and targeting your ideal customer, it becomes progressively easier to hold onto and be of service to that customer, and gather several prospects on the outer rings of your hypothetical bullseye. Knowing where their pain is, and how to best address it is invaluable. Put plainly, the more strategic you are now, the easier it’ll be to relax and take a day, a week, even a month off. Because you’ll know how to find and guide your perfect customer into your sales funnel without even being there. So start with the strategic work. This should go without saying, but its honestly something a lot of people miss. This isn’t the early days of AOL and Yahoo where people threw out their email willy-nilly to anyone who asked. Because email has become one of the primary methods for communicating and marketing in the business world, they now have considerable value. No one wants their in-box filled with a bunch of electronic junk mail, even from the people they want to do business with. And the last thing you want is to have your prospects limited because you’ve been red-flagged by MailChimp, aWeber, or Constant Contact – or worse Gmail or Outlook – as a purveyor of SPAM. So make sure what you’re offering people who come by your website is a Lead Magnet that is immediately valuable for them and specifically targeted to your ideal customer. Seriously, when it comes to sales leads, the need for quality, qualified leads far outstrips the desire to have lots of random emails. Give them something that they see the value of within 5 to 10 minutes, and make the title something that spurs them to open it. I feel weird mentioning this one, but for some reason, there’s a lot of business websites that try to lure you in with a Lead Magnet, only to bombard you with PAGES of text trying to convince you of the value of the offer, only to get to the offer and it’s not what you were expecting when you clicked over there in the first place. Or there’s the sites that try to create some click-bait-y title that gets eyes on the page, but then offers something completely different. Like if I were to suddenly go off on a tangent, in the middle of this article, about learning survival skills for the coming apocalypse. Sure, I know that about 3-5% of the Grow The Dream audience would keep reading (you see how that strategic work comes in handy? ), but for everyone else, that’s a red flag! Another thing to keep in mind – if you’re planning on cross-promoting your Lead Magnet with Facebook ads, the number one reason ads don’t get approved is because the Landing Page that the ad links to – the Lead Magnet opt in – is different than what the ad promises. By making sure everything’s aligned, you’re killing two birds with one stone. Bottom line, you want to make sure that what you’re promising is what you’re delivering. The purpose of the Lead Magnet is not to sell. Let me repeat that. The main thrust of the Lead Magnet is NOT to sell. The purpose of a Lead Magnet is to qualify visitors to your website and to begin to build a relationship with them that survives their window shopping phase. The best way to do that is to give them something of value that educates them on something you know well. So I wouldn’t offer “The 17 Things Every Legal Contract Must Contain.” You probably wouldn’t take me seriously. But, if I said I could give you a report with “5 Ways to Increase Responses to your Emails and Blogs,” now that’s something I and my colleagues clearly know something about. And something you could use. I also wouldn’t offer the report and have it just explaining that the best tip is to just hire me to do it. It has to be something that your prospective customer can implement with or without you. The fact that I could do it better than they could on their own is value they can discover – I don’t need to hit them over the head with it. Remember, in addition to acquiring the email of a prospective customer, a well-crafted Lead Magnet gives them value and shows the value of your knowledge and expertise and how they could be applied. This is another point that seems basic until you realize how few companies remember to apply it. Whether you are sending a Lead Magnet, or a follow-up email, there is one thing that must always be included – a call to action. You have to be very obvious and explicit when asking them to take the next step. As the creator of the Lead Magnet and the company that is hoping to get this stranger to do business with them, tell them exactly what the next step is and put it right there in an easy to find format. A “BUY NOW” or a “FOR MORE INFORMATION” button or link is vital to getting them to follow-through. So don’t neglect it. Not to toot our own horn, but we started telling our marketing clients this more than 10 years ago. The rest of the business world is, thankfully, starting to catch up, which means there are more tools than ever to make sure you are tracking your prospective clients’ behavior. We’re not talking about stalking, real or virtual, but keeping track of how people act and react to your marketing and promotional materials, starting with your website. This is where the strategic work takes a deep dive, and if you have the proper tools in place, you can hone your efforts down to laser precision. And see where they’re not working as well. Behavioral marketing takes all the guess work out of finding and serving your ideal customer, and there’s no better tool for that than Infusionsoft. A few of the many questions Infusionsoft can track for you: Are people opening your Lead Magnet or emails? How long after its sent to them do they open it? Do they open it multiple times? Do they click on links – the call to action, your social media buttons, the unsubscribe link? Do they buy? How long does it take before they buy? How many steps in the process? Now you have hard data to help you decide whether or not a Lead Magnet or any other type of outreach is working. You can adjust, tweak and get almost instant results on the changes made. If you’ve grown to the point that you have to answer to investors or a board, you have actionable information on why what you’re doing is the best approach. And you can run A/B tests to check their suggestions as well. Going back to my “0” point – it’s not strategic if it’s not measurable and trackable. If you want to truly succeed, you need to have both. Most of us have heard the adage at one point or another: customers almost always buy from people they know, like and trust. That’s why having great stories told about you and sharing them with prospective clients is an advantage. But it can’t do all the heavy lifting. Remember 70% of people who land on your site will not only not buy, but won’t even remember they were there, let alone return. One of the main purposes of the Lead Magnet is to keep you at the top of their minds when they decide to buy. But that only works if there’s a positive correlation. Every Lead Magnet, every email, every time you ‘touch’ the prospective client, you should be demonstrating your value and credibility. You may only get one chance at a first impression, but in business, the last impression is the most valuable. Everything builds that bridge of trust that will lead to the final sale – or ongoing service. It all starts with the Lead Magnet. I mentioned this in the other article, but it bears repeating – Prospects that don’t buy right away, but are followed up on and with which you consistently build trust and credibility, will account for up to 50% of your sales. Lead Magnets can be valuable tools – if done properly. As you’re figuring yours out, use this checklist to make it as effective as possible and you’ll be ahead of 60-70% of your small business peers. If there’s any tips you think I missed or your fellow readers would benefit from, please take a moment to drop them in the comments. Our mission is to help everyone flourish, see their business expand and Grow their Dream!